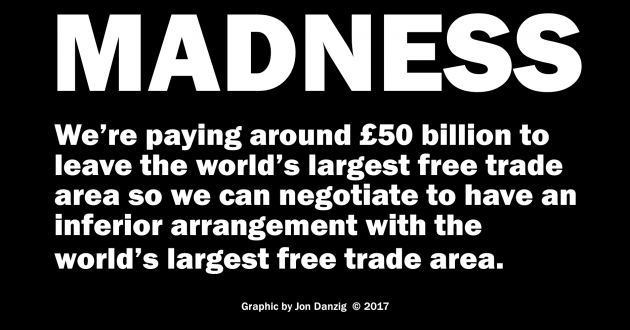 David Davis only last March said we’d never pay anything like a £50 billion settlement to leave the EU. Boris Johnson said the EU could go and whistle for the money. Priti Patel said the EU should be told to sod off. During the referendum campaign nobody was told anything about the cost of leaving the EU. We were only lied to about all the money we’d reclaim – including the nonsense that the NHS would get an extra £350m a week. And yet here we are. We’re going to pay a large amount to leave the EU because those are our obligations. We can’t wriggle out of the payments we signed up to whilst a member. 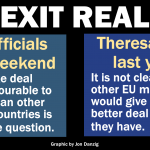 The EU stood firm, whilst Mrs May and her hapless team of Brexit ministers huffed and puffed and let months go by living in denial. And here’s the oddest thing. 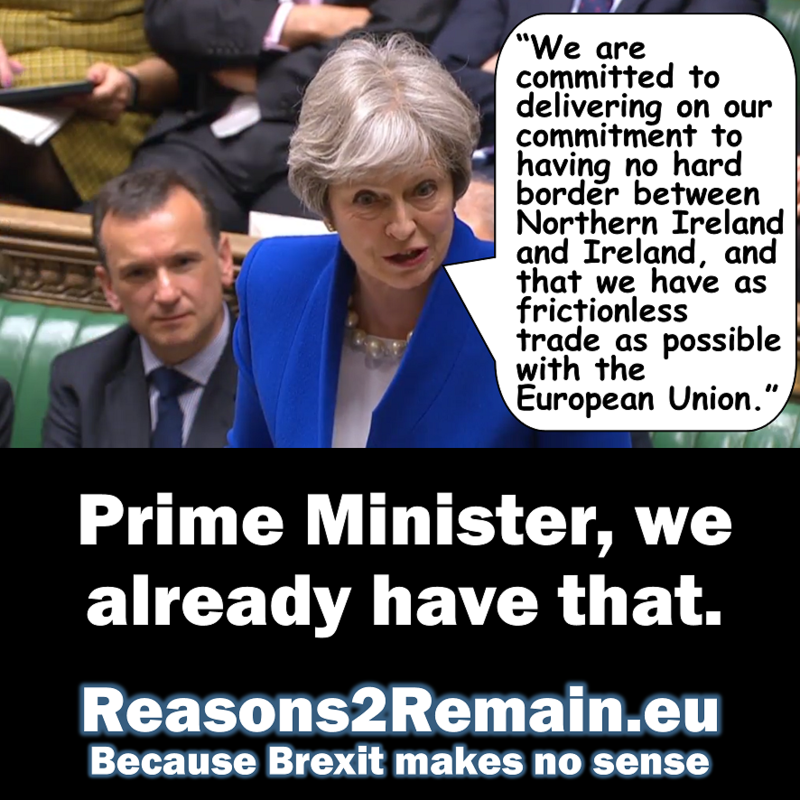 The UK government is negotiating to leave the EU, just so they can negotiate another arrangement with the EU to give us as much as possible of what we’ve already got, but on considerably inferior terms. Of course, it’s not going to happen. In two words, it will be the EU telling us to ‘sod off’. So here’s the bottom line. Britain needs frictionless trade with the EU. We need free movement of goods, services, capital and people for our country not just to survive, but to thrive. 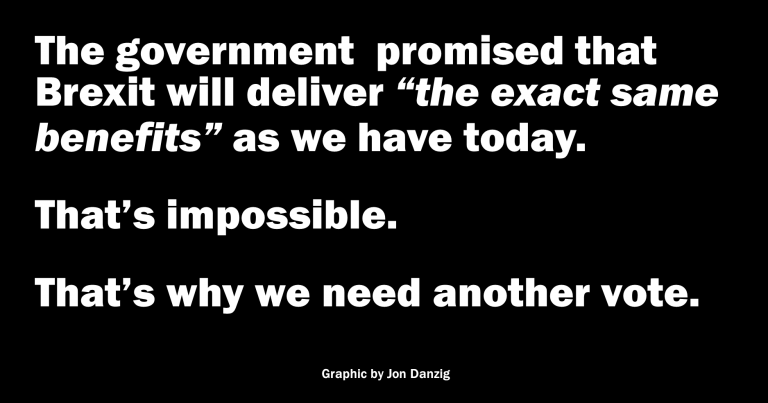 We need to continue with the status quo: the arrangement we have now. We’re going to pay around £50 billion – money that will come from us, you and me – to try and achieve what we’ve got, but less of it, and on considerably inferior terms. we enjoy excellent EU trade agreements with almost 60 countries, with more on the way, on advantageous terms that Britain is unlikely ever to replicate. So, we’re going to pay £50 billion to throw that all away, just so we can get an inferior arrangement with the EU, in which we’d still have to agree to the rules of EU trade (over which we’d have no say) and we’d have less access to our most vital customers and suppliers outside of our home market. No. 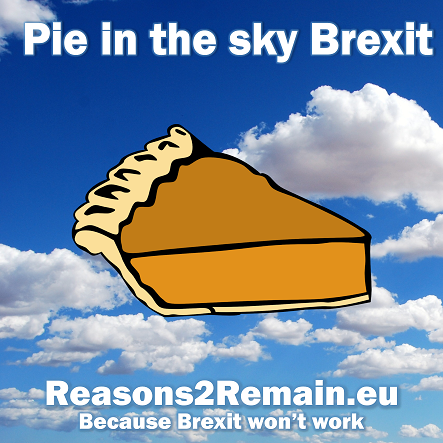 All the reasons given to leave in last year’s referendum were based on lies and false promises. There are no good reasons to leave. Most EU migrants in Britain are in gainful employment, doing jobs that we simply don’t have enough Britons to do. So if they all left, we’d have to replace them with about the same numbers of migrants as we have now to get all those jobs done. What’s the bloody point of that? More houses, schools and hospitals? Think again. Without EU migrants we’ll have fewer builders, teachers, doctors and nurses. Migrants are not the cause of our problems. Blaming them just excuses successive UK governments from investing sufficiently in our country. Get our country back? We never lost it. If being in the EU means losing your country, why aren’t the 27 other EU member states complaining? But in the EU, we benefit from laws for our continent that no single country alone could ever achieve. Could our UK government have got mobile phone companies to scrap mobile roaming charges across the entire EU? Of course not. It took the might of 28 EU countries working together to achieve that, and so much more. We are leaving for no good reason, not one. We are paying £50 billion to leave. We will be poorer, and with less sovereignty, fewer rights and protections, and restricted trade, and diminished power after we’ve left. 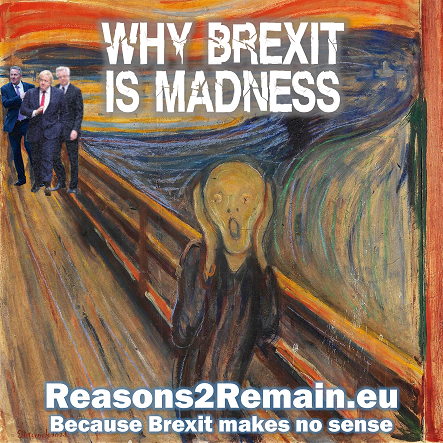 This entry was posted in Current Affairs, Democracy & Citizenship, Economics & Trade, Law & Justice, Politics & Public Policy, The EU and tagged £50 billion, Boris Johnson, brexit, David Davis, EU divorce, European Union, Priti Patel, Theresa May. Bookmark the permalink. Next: Break-up of Brexit or break-up of the UK?